I haven't previously bought Essie Watermelon because I (mistakenly) believed that it was a very similar shade to Revlon's Parfumerie in Ginger Melon, which I already own. Now I've compared them I've discovered that actually they're quite different shades, with Ginger Melon being a lot paler. I only actually bought this shade because I needed another nail varnish to be the 'free' one in a 3 for 2 offer on BeautyBay. I'd picked out two shades that I wanted from the OPI Gwen Stefani Holiday collection that were already on offer anyway, but didn't want another OPI shade as they were all full price. As Essie was also included in the offer I decided to have a quick browse of their shades. 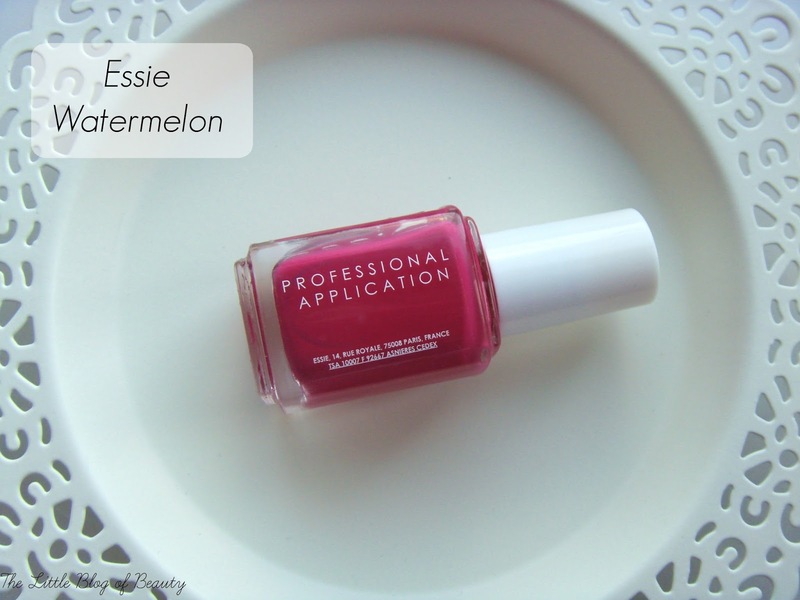 I was disappointed that despite having around five pages of Essie nail varnishes they only had one of the big name shades (I mean Watermelon, Bahama Mama etc) so I decided to give Watermelon a try. I'm very glad I did. Despite being rather nail varnish obsessed at the moment this is actually only my second Essie shade. I thought one of the things that made Essie nail varnishes so popular was their wide brushes, so I was really surprised to find a thin brush. A quick tweet gave me the answer, apparently Boots stock the Diffusion line, which have wide brushes, and this one is from the standard range, which have thinner brushes. I don't find the thin brush a problem at all, in fact I often prefer thinner brushes to wider ones as I have quite slim/small nails and wide brushes can mean I end up making a mess. This is definitely a 'one coat wonder', you can pretty much just paint on one coat and go and you could even get away without using a top coat as this has a lovely glossy finish to it. This is a gorgeous shade, possibly one you would reach for more in the spring/summer but it has definitely brightened up my fingertips in this dull weather. Watermelon is the perfect name for the shade. 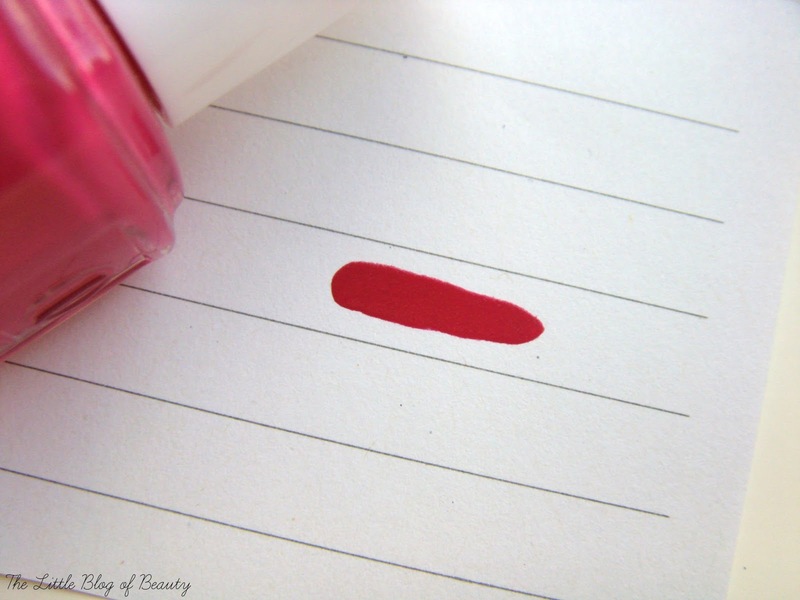 It's a very juicy looking, bright, deep pink/red, a bit lighter and brighter then it looks in my paper swatch. This has already been on my nails a couple of times despite only having it for a week and I do have some nail art using this that I'll hopefully be posting shortly depending on whether I can good some good pictures of it. 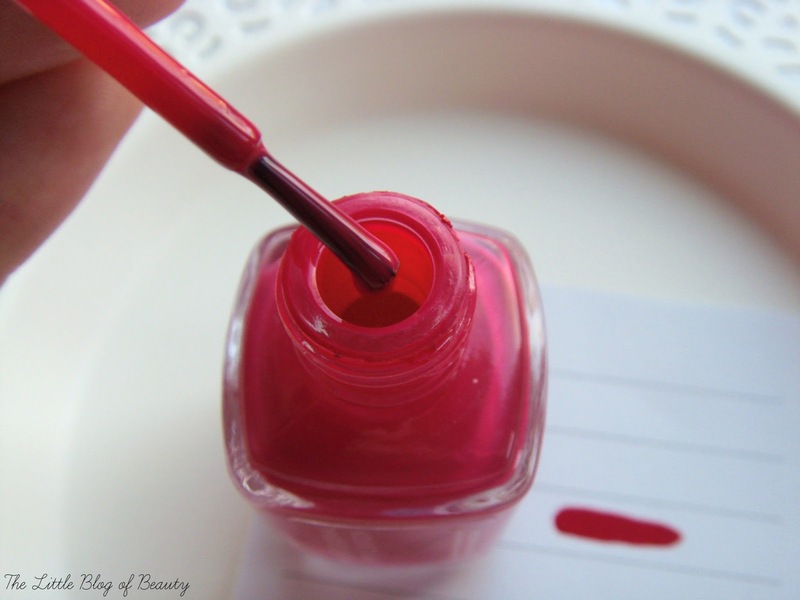 Are you a fan of Essie shades? I have never had a Essie nail varnish, Im not sure why, I always look at them. I love this colour though. It is beautiful. This is one of my most favourite nail colours ever. Such a pretty pink.